I’ve been playing Into The Breach by Subset Games and it has taught me fantastic lessons about game design. While not immediately impressed by the graphics of the game, it was no issue during play. Seriously, it is a Good Game – if you like strategy games and roguelikes do pick up a copy. The only complaint about graphics is this: I want more of them! The low-resolution pixel art makes a lot of sense cost wise – there are a lot of assets in the game to make, and pixel art is time consuming. It also makes a lot of sense in terms of brand recognition. Subset games also made FTL in a pixel art style. Maybe it is just because they have strong pixel art skills. I really enjoy the pixel art portraits of the mech pilots, and would love if the game had the same level of detail in the units and tiles. 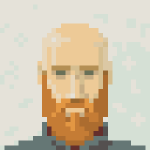 In fact, I loved them so much I want to do a series of pixel art portraits inspired by them just for the fun of it. It’s been a while since I made any pixel art and I’m feeling quite rusty. I used Piskelapp for this one anddidn’t find my old account – it may have been wiped! Oh well, they served their purpose. As always, learning by doing. I don’t feel happy with it – I see it and I see a bunch of issues that need to be address, but I am sort of happy with it because it didn’t take me long to do. I would like to try to tidy up the colours and have more defined areas of light. Maybe it will be easier if I didn’t also have to look at my own face! In any case having something to be critical of *does* feel nice. It’s progress. Nobody is instantly good at anything. Do you prefer one over the other? Let me know!